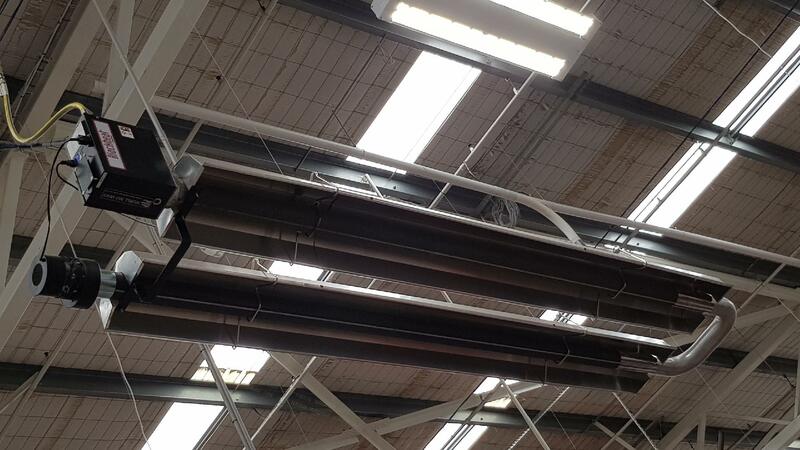 Are you looking for an affordable and durable heating solution for large industrial or commercial spaces? Do you wish to speak to the industry leaders about your needs? Hurll Nu-Way is Australia’s trusted provider of industrial and commercial heaters. Made with top quality materials our radiant infrared heaters will last you for more than 20 years. Call us on 1300 556 380 to learn more! Radiant heating is the energy efficient way to heat large open indoor areas such as factories, warehouses, aircraft hangers, school multi-purpose halls and other commercial and industrial buildings. 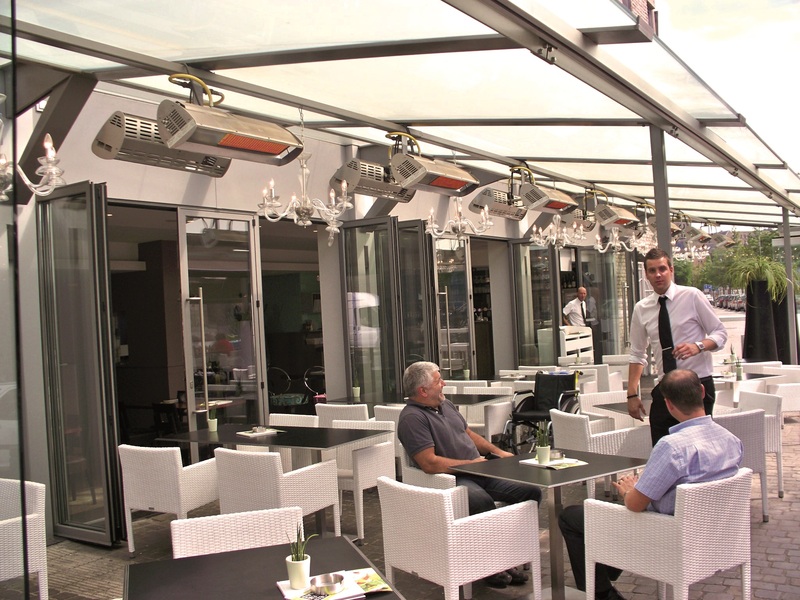 In addition, you can increase your outdoor season and enhance the design of your venue with infrared heaters with a choice of low-intensity infrared heaters, namely the USA/UK manufactured radiant tube Blackheat, and high intensity ceramic infrared heaters by French manufacturer SBM. We offer a variety of outdoor heating solutions, taking into account design of the venue, space available and heat required. Choose Blackheat if you need gentle heat over a wide area and especially if you have a drop-down screen for bad weather. Go for French heaters if you want something bright, as these ceramic luminous heaters were specially developed for terrace heating, combining design, comfort, and robustness. Both types of heaters save floor space with fixed installation, are environmentally friendly and have a fantastic lifetime of over 20 years. Please check our radiant heaters microsite focused on these products. Interested in other heating possibilities? We also provide great industrial fan heaters! The installation of any industrial equipment should be done by experienced people with the right equipment. Contact us for a comprehensive list of authorised installers in your area. Industrial heaters are costly equipment, which is why it should also be durable. We pride ourselves on providing customers across Australia and beyond with top-quality heating solutions tailored to their spaces. Call us today on 1300 556 380 to discuss your heating requirements, or feel free to fill out our enquiry form and we’ll get back to you quicker than quick. Tansun has pioneered the concept of infrared electric outdoor heating. With over 30 years of experience, Tansun is at the forefront of technology and has been working in collaboration with Phillips. They distribute their products to a network of over 50 countries worldwide. Tansun has a dedicated R&D team who are always developing concepts, staying at the forefront of the industry, and exceeding new international standards. All of Tansun’s products are designed and made in Britain using premium components in the manufacturing process. At Hurll Nu-Way, we pride ourselves on supplying innovative, energy efficient and high-quality products from world-leading brands to industrial and commercial premises across Australia. As with all product and service options we have available, our radiant ceramic heaters are cost-effective and quality way to help your business and your needs. Infrared rays produce heat within the objects they meet. They naturally heat the floor, machinery and occupants without wasting heat in the roof of the building. Infrared rays concentrate heat where it is needed and propagate naturally in the chosen direction without losing energy during transmission. Infrared heating is almost instantaneous, and therefore the 'comfort level' is reached very rapidly. As there are no moving parts it is silent and creates no draughts or dust movement. Ceramic elements have the greatest capacity to transform energy into directional heat rays. The honeycomb pattern and outlets of each individual plaque keep combustion inside the ceramic material, increasing the surface temperature as well as the infrared heat emission. Stainless steel fins stabilise post combustion, recover energy and further increase radiant output. The stainless-steel casing and reflector assemblies provide robust construction of the complete heater to allow for a long operating life. The possibilities of partial heating, selection of temperatures by area and programming of operating times enable optimum energy usage. For most commercial and industrial premises, the flexibility of radiant heaters brings optimum comfort to personnel with energy consumption considerably lower than any other form of heating. These radiant heaters can even be used for home. If you’re interested in a gas infrared heater for your industrial, commercial or home property, make an enquiry with our team of experts today. With our range of products, including air knives, gas boosters, HV fans and more, you’ll find what you’re looking for at Hurll Nu-Way. At Hurll Nu-Way, we employ a team of factory trained and qualified technicians to help you find the perfect solution for your industrial or commercial property. Let us help you find the best gas heater to suit your property’s needs. Contact us on 1300 556 380, or use our simple online contact form, and we’ll get back to you with all the information you require to make an informed choice. Are you looking for a low intensity heating option for a large property or space? At Hurll Nu-Way, we carry a wide range of heating and cooling options for industrial and commercial properties, including low intensity gas tube heaters. This option gives you more energy efficient equipment that equals a better long term ROI, as it efficiently heats large spaces, such as factories, warehouses, multi-purpose school halls and aircraft hangers using low energy consumption. Gas fired low intensity radiant tube heaters produce infrared radiant heat from a large surface (tube) area, and are ideal for situations where there is ample wall or ceiling / roof space. Radiant tube heaters are available for operation on Natural and/or LP gases and supplied in straight, 'U' shape or 'double ended' DL patterns. Internal turbolators (swirlers) extract the maximum heat from the combustion process before the end of the tubing set. For Greenhouses, barns and farms the infrared heat brings comfort to animals, dry heat to the plants, and energy savings. You can find all the radiant tube heater information at our new micro-sites focusing only on radiant heaters at radiantheater.com.au. Do you have any questions regarding any of our products from world-leading brands? Contact our team today! If you’re ready to invest in an energy efficient and cost-effective heating option for your warehouse, contact our experts today. Simply call us on 1300 556 380, or use our online contact form, and one of our team will get back to you shortly with all the information you require to make an informed choice regarding our low intensity radiant tube heating options.